Northrop Grumman will move forward with the engineering and manufacturing development of an open system architecture for the U.S. Air Force’s next-generation navigation system as part of a recently awarded $59M contract. The company said Monday it will create the hardware and software design under the EMD phase of the Embedded Global Positioning System /Inertial Navigation System-Modernization project. Other efforts will involve producing hardware for the integration and qualification processes, producing safety and civil certification documents, qualifying systems to military standards and building test units. Northrop conducted EGI-M technology maturation and risk reduction efforts through a $49M contract awarded in 2017. Dean Ebert, vice president of navigation and positioning systems at Northrop, said the latest award marks a step toward deployment of an updated system for warfighters to receive positioning, navigation and timing data even in GPS-denied environments. EGI-M will feature modern receivers built to transmit and secure new military signals for space. 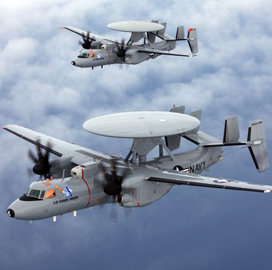 The system is designed to comply with the Federal Aviation Administration’s NextGen air transportation system requirements and integrate with the F-22 and E-2D aircraft platforms.